Uncertainty is on our minds as we approach this election and as we look at everything from the stock market’s volatility to job growth. Why does the market swing? Uncertainty. Why do companies slow hiring? Uncertainty. Uncertainty about quality. Uncertainty about timing. Uncertainty about safety. And the list goes on. Any executive or dedicated employee knows that breaches in certainty in these areas can bring a company to its knees. At Glaro Inc. we know that when a company is certain, so will their customers be. Even with so much uncertainty on a macro level, we know there are so many ways that we can create, manufacture and deliver “certainty” everyday. At Glaro Inc. we have worked very hard to build a real American brand that is able to own every step of the manufacturing and service process from end to end. Glaro’s total in-house concept and its long history of manufacturing on American soil create the structure within which this can happen. In fact, from R&D, engineering, metal spinning, machining, tooling, fabricating, forming, stamping, spinning, powder coat painting, degreasing, and assembly to shipping, the manufacturer maintains complete control over quality, including its timelines. “Tight controls and attention to detail every step of the way create consistency which creates certainty. And certainty creates confidence and loyalty in our dealers and their customers too,” commented Robert Betensky in a recent interview. 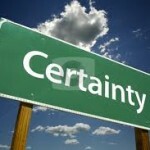 In sum, certainty is something our economy needs to grow and something we all seek in our lives in one way or another. Our small way of making that happen is by continuing to manufacture in America and hire in America. Every time someone buys a product, they can be certain that they are supporting the American economy. That’s why we come to work everyday at Glaro.